Carnival of Genealogy 70th edition topic is Uncle, Uncle! This edition is all about our uncles. Have you got a favorite or interesting uncle? Tell us about him! Maybe you had a older cousin, neighbor, or friend you called “uncle”… that works too! No uncles in your life? No problem. Write about any gentleman on your family tree who was an uncle to somebody. George Lineberry was born in 1912 in Oklahoma City, the sixth of seven children born to Jacob and Eva Lineberry. In 1915, when George was thirteen years old, his father died and, as was fairly typical for the time period, his mother remarried within about a year. Over the next few years, Eva had two more children; then in 1922, when George was ten, his mother died due to complications from the birth of her tenth child, who also died. The family was living in Oilton, Oklahoma at that time. Their stepfather was not given custody of the children so the oldest brother, Willie, escorted five of his siblings by train to Galax, Virginia where he left them to live with various Lineberry relatives. (Their stepsister, June, and stepbrother, Arthur, were sent to live in an orphanage until their father remarried and was able to get them). None of the boys [Johnnie (16), Leonard (14), Joe (12) or George] had a steady home but rather stayed in one home after another. The youngest child, Virginia (8), though allowed the benefit of staying in only one home – the farm of her Uncle Dave and Aunt Piety – had only occasional opportunities to see her brothers. Virginia, my grandmother, said her brother Johnnie lived in Galax and worked at a furniture factory while Leonard and George both lived with Everett Bryant (who owned a saw mill). Leonard worked at the saw mill until he was fifteen; George lived with Leonard, while Leonard worked, and was able to attend school. In the back hills of Virginia school generally consisted of only a couple of months each year. Although George also stayed with the Russells, Virginia said he would hardly stay with anyone but Leonard or his Uncle Harv. Joe worked in another saw mill with a cousin, Euliss. Not having a permanent home seems to have manifested itself in George by a bit of wanderlust. My Grandma said he frequently rode the rails all across the country, even making it up for a visit with a maternal uncle in Canada. Though his life was cut short by his death during World War II, up to the very end, he apparently took advantage of his time in England, France and Holland to see more of the world and to buy little mementos to send home to his family. Over the years, the Lineberry siblings had some hard times. Sometime about 1923 Willie, the oldest, was involved in something that the family has never fully shared or understood but it resulted in him serving time in prison. 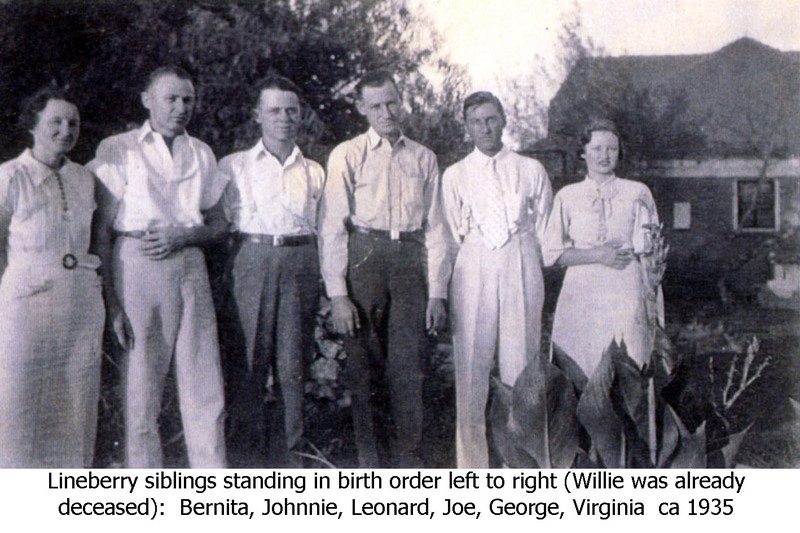 In 1929, while Willie was still serving a prison sentence at McAlester, Oklahoma, their oldest sister, Bernita, drove to Virginia to bring back any of her siblings who wanted to return to Oklahoma. Though George did not make the trip with Bernita, he did return on his own. Not long after they returned to Oklahoma, in 1931, the tuberculosis Willie had contracted in prison worsened and he received a special release from prison so he might die at home. As you can probably gather, George and his siblings had many difficult times in their early lives. George had limited education and opportunities but by all accounts he was a great person who cared for his siblings, nephews and nieces. He never married but had many girlfriends and had, according to the family, intentions of marrying Nina Robinson, a girl from Galax, Virginia. My great uncle George was drafted and entered the army in February 1941. He served in the 101st Airborne 2nd Battalion Headquarters Company of the 502 regiment. Over the years I asked my Grandma as well as other relatives about George and no one ever really knew what happened to him other than he was killed in Arnhem, Holland on September 18, 1944. Discussing her brother’s death remained painful for my Grandma so I was sparing with my queries. Early this year, a year and half after my Grandma’s death, I began asking questions again but this time on the Internet. One of my first steps involved posting my query on the online forum called Trigger Time, which is a group of researchers of the 101st Airborne. By January 8, 2009, Mark Bando, an author and researcher, shared a troop photo of George with me; he also provided contact information to four living veterans who may have served with my great uncle. I phoned each one of them and had wonderful conversations with them. One of the gentlemen remembered George as one of the older men though he didn’t actually know him; he knew when he was killed but had no additional information. Another veteran, George Koskimaki, was a radio operator for General Taylor and is one of the Division historians and an author. We spoke on January 15, 2009 and when I told him my great uncle’s name he said he remembered the name probably because he had to type the roster many, many times. He asked me to write to him, mainly as a reminder, and he would see what he had about my great uncle. Mr. Koskimaki writes articles for a 101st newsletter and sometimes writes about a specific person and includes a photo. He said, “You’d be surprised at how many people remember the person when they see the photo with a few details.” So, I wrote to Mr. Koskimaki and provided a photo of George. About a week later I received his reply and it included a roster and some information on the 101st newsletter. I shared with my family all that had transpired in my research and asked one of my 1st cousins once removed, Billy, what he remembered about George. Billy was a young boy at the time George left to go overseas and he has very fond memories of him. To help with my goal of learning more about George, now becoming a family shared goal, Billy typed a document of his memories of his favorite uncle, George, and sent it to me on February 10, 2009. Then on March 13, 2009 Mr. Koskimaki wrote me again with amazing news. Yesterday I received a copy of a recently published book by Guy Whidden. He asked me to review it and write a blurb about it in my K’s Korner in the 101st ‘Screaming Eagle’ Newsletter. I opened it up and the first page I turned to (234) has a picture of George Lineberry with three other troopers. I immediately thought of you requesting pictures of your brother. That picture peeked my interest and I noted that George was mentioned several times in the text. He must have been a close friend. Here is the address for Guy Whidden…He is probably calling you right now as I finish typing this letter. He was with George when he died. I am sure you will find the closure that you had hoped for. I received the letter on March 16 and the following day I called Mr. Whidden and learned more about George and his death. I sent an email to several relatives sharing what I learned from him and the next evening my 1st cousin once removed, Richard Lineberry, phoned and I provided Mr. Whidden’s contact information to him. He then shared with me that sometime recently he had prayed for enlightenment on George and he believed that finding Mr. Whidden was an answer to this prayer. Mr. Whidden was not able to share much in his letters home at the time but here are excerpts of those that discussed this incident. Note: at the time of the letter, he was not aware that the third friend had died. Note: Mr. Whidden tells us in a footnote that he didn’t mention to his father how outnumbered they were and that they were mostly surrounded all of the time, at least on the first day of the battle. …You asked me how long it was before I was treated, and you want to know more of the details; so long as you want to hear it, here it is. A few that I have been to and a little of what happened: I jumped west of St. Martin de Varreille on D-Day in France and we were spread over 30 square miles (our regiment). We had our big engagement at Carentan. Our bn. Came to the rescue of the other bns. just as as the German S.S. and the paratroopers were attacking in force. Our only route to the battle area was through waist deep water on both sides of the causeway, but the causeway itself was unsafe because the Jerries were raking the causeway with machine guns. One of our col.’s as a final fling ordered a desperate bayonet charge (he got the D.F.C. Later on). [Note: LTC Robert G. Cole] At the time we came in and saved the day. The Jerries are clever and they pulled a fast one on us. They pulled a truce to talk over surrender terms. It lasted long enough for them to change all their positions and make other preparations. They refused to surrender because they said that they feared that we’d kill them (as we had been doing with prisoners for good reasons). Later on when we had contact with the rear, we treated prisoners with respect. They (the Jerries) called, the “Americans with the baggy pants”, and they would think twice before they’d meddle with us. Some of our boys jumped on D-Day into Carentan itself and were shown no mercy. They were knifed in their chutes. Some of those who dropped in trees were cut to pieces. The night we jumped was something, I’ll never forget – the flak and machine gun fire was something, and as we stood up to jump the plane rocked like hell as flak missed our plane. A couple of planes landed off the coast and a couple in the flooded area. It was a great experience. Kay, you have written and put together a wonderful picture of George and his life. I have truly enjoyed reading about him and his brothers and sisters. How lucky to find Mr. Whidden and Mr. Koskimaki and learn the information you have so long wanted to know. I look forward to reading more of your posts and your very interesting family. This is an amazing, complete picture of your uncle. Congratulations on the wonderful carnival submission. Just saw this website tonight. It’s great! Thanks for all of your detailed research. Wow nice story…i am going to meet guy whidden in sept. we will go to the places he fought and got wounded and also to ovisit his buddy at the margraten cemetery…..to put some flowers on his best friend grave…..thank you for the heroic act of you uncle…! Ralph, thanks for reading about George. I am still amazed by what seems nearly impossible, that Mr. Whidden would write about his experience that included my great uncle and that all things came together for me to read it. How exciting that you all will meet and be able to visit those places and place flowers on graves. I would love to be able to get some photos and/or a map of the location where they were wounded.